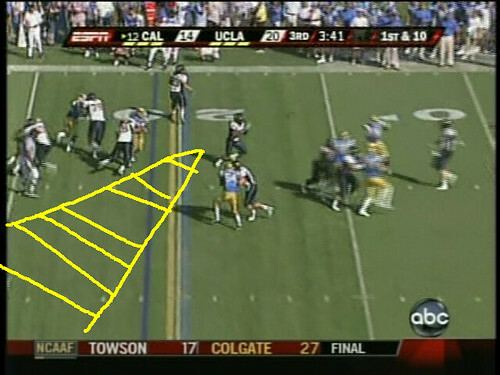 Today we look at particular examples of how Cal would attack the UCLA’s Cover 4. If you recall from yesterday’s post, two particular ways to attack the Cover 4 were to work the outside routes. I’m not going to go into too much exposition, just show pictures of how Coach Tedford picked apart the defense when UCLA lines up in that formation. 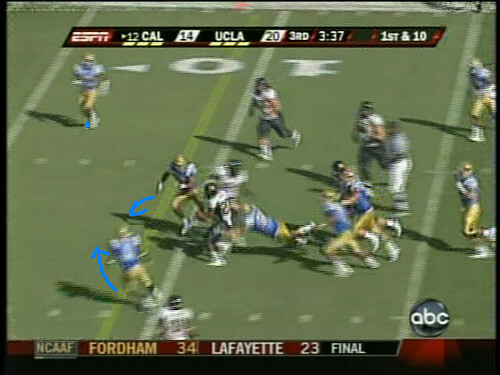 Again, look at the distance between back and receiver. DeWayne Walker used the Cover 4 defense a lot to ensure no Pac-10 offense would beat UCLA deep–you’d have to dink and dunk your way through the field. 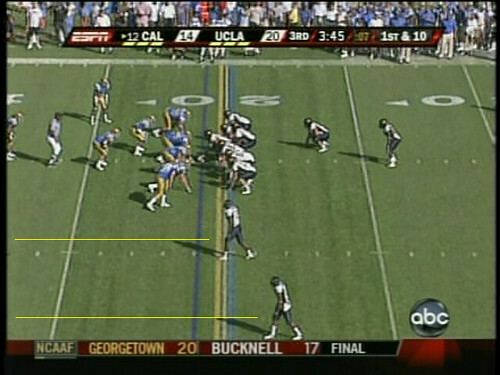 The yellow line indicates how far the wide receiver (in this case, Tha1) can go without having the defensive back pressure. The UCLA defender (the cornerback Trey Brown) again is guarding against the deep ball on DeSean, and you can see he’s backing up (the baby blue) from his original position to cut off Longshore’s deep route and take away his arm from beating them deep. You see this blue circle? 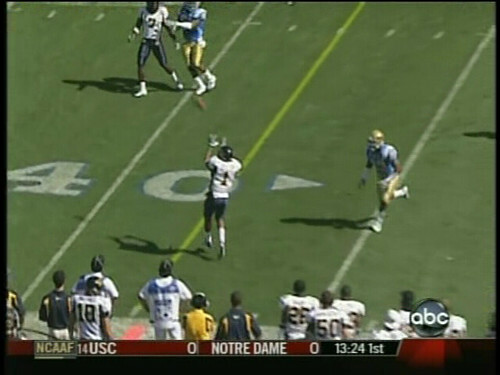 That’s all for the receiver as long as the D-back plays for the deeper ball. DeSean has plenty of area to work with, whether the play’s designed for him to go inside, outside, or what-not. So when Jackson makes his cut, the defensive back has too far to get back to the play. Thus when DeSean makes the catch, the defender still has three/four yards to cover. 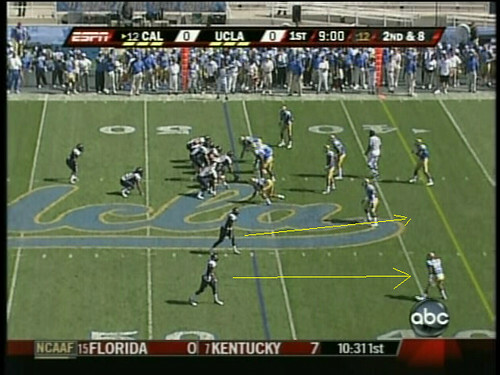 Good simple out route to exploit Cover 4 (Cal would use it later in their ultimate error). Layrelle Cunningham would convert a similar play later in the game, although the corners played about five yards closer the more Cal focused on the short routes. More of the short game is covered by the screen passes Longshore threw to disrupt the pass rush. 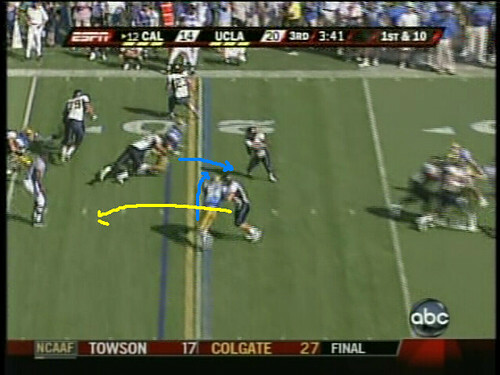 Examine again another Cover 4 situation and how Cal turns a short pass into a large gain and a 1st and goal. The corners are playing deep to avoid the touchdown ball, and you can see the yellow line separation between defender and receiver. This open space will come into play later. Thanks to the great blocking by the offensive line, we have the dream scenario for a running back unfolding–open field. Now look at the opening with the screen! Because the wide receivers are running long routes, the corners have to follow, leaving the left side ready for rumbling. So, if Forsett can break any of his initial tackles he has daylight on the left. Credit Craig Stevens (the blocker just below Forsett) for holding off the linebacker Bosworth from getting the inside angle and pushing him out of the play. Forsett is small, but he can use that to his advantage in the open field to avoid bigger defenders by speeding his way through. Take a look at how the edge opens up as he zips past the one defender now on the ground (he’s sad) and how Bosworth is well out of the picture thanks to Stevens. Defensive backs have to readjust from covering wide receivers to overcoming wide receiver blocks to tackling Forsett, which requires convergence and getting in front of the running back. 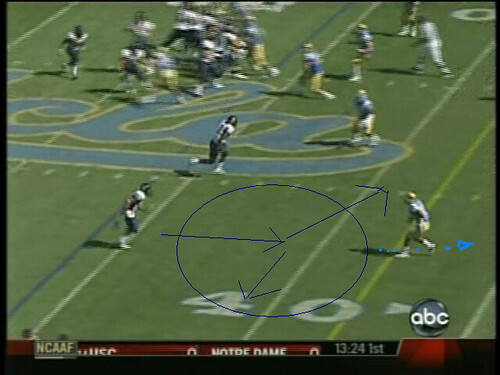 The angle down the middle of the field is not easy to tackle though; the defensive backs have to come from the sides. 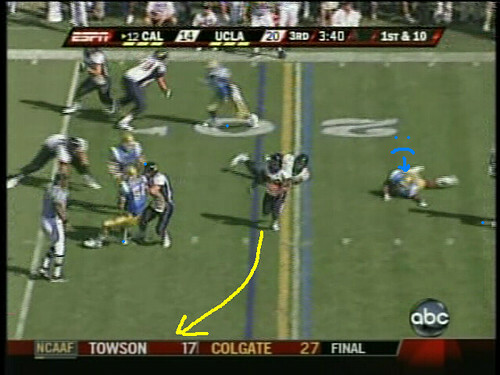 The result is a goalline 1st down that ends in Cal’s last TD. So you can see that the key is to go to the outside because of the depth the corners go to prevent deep balls. In one case Jackson cut at just the right place to provide enough distance between him and the defense, in the other Forsett found the opening on one side to pick up big yards. These are just some of the many ways Cal attacked the Cover 4. 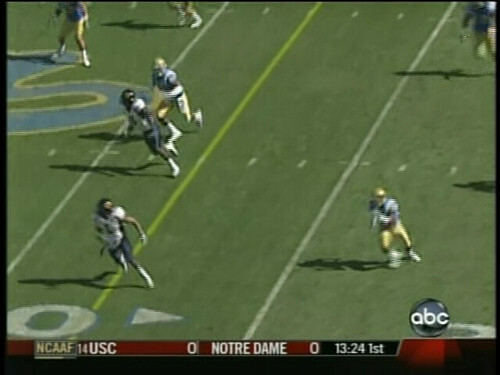 Later on, we’ll see how UCLA fought back.